Well, that’s that, then. The hard courts have been wrapped up and put back in the cupboard for another few months and the tours are heading back to Europe to begin the long, red path to Roland Garros. The clay court season is upon us and tennis is hurtling towards the most intense three months of the season. We have two grand slams to sort out within a seven week spell from the end of May to the middle of July, we have 22 clay court titles to decide before we get to Paris (we are not counting Challenger tournaments and the like because we have run out of fingers) and we have a whole new heap of runners and riders to assess before we even start. Alarmingly for those of us of a certain age, by the time we see a hard court of note again, we will be heading for the US Open. By that point, some people will be totting up the shopping days until Christmas and most turkeys will be calculating the gobbling days until Thanksgiving. Life moves fast these days, even for turkeys. As the season started, it seemed as if we were in for a year of change. True Novak Djokovic won the Australian Open – as he usually does – but the manner of his victory, particularly the final match against Rafa Nadal, gave the impression that he was ready to dominate in the way he had in 2015 and 16. Since then, though, not so much. 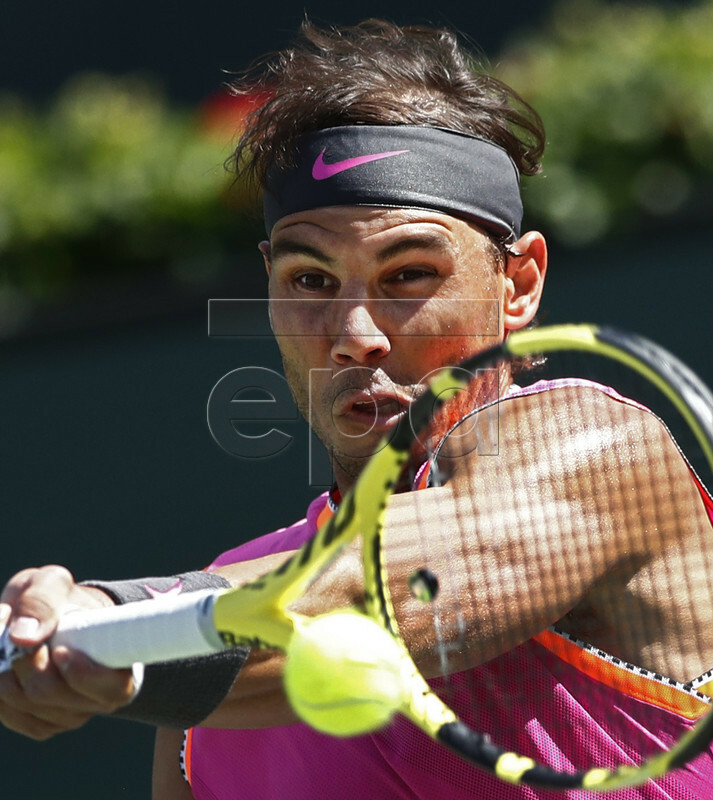 Early losses in Indian Wells and Miami, where he was the favourite, took some of the shine of his new suit or armour. Djokovic is good on clay – extremely good – but, then again, so are a lot of other people. The main other person in that statement is one Mr R Nadal of Manacor in Mallorca. And judging by the pictures, Rafa is as happy as a clam at the moment. He is enjoying the two things he loves most: being at home and playing on the red stuff. The knee injury that forced him to pull of his Indian Wells semi-final with Roger Federer appears to be on the mend and he is practising at his academy in Mallorca. The sun is shining and he is getting ready for a tilt at a 12th Monte Carlo trophy. After that, he will be aiming for a 12th Barcelona title, a sixth Madrid crown and a ninth Rome win. And all of that before he tries to make his collection of Roland Garros trophies a nice, round dozen in June in Paris. When he left California, he sounded miserable to have picked up another injury but confident that he would be ready for the start of Monte Carlo on April 14. He got back into training last week and still has plenty of time to make a flying start in the millionaires’ playground in a couple of weeks. Another big name seen – rather surprisingly – with a tennis racket in hand this weekend was Andy Murray. Now, he is not in training and he has no intention of playing for a long while yet but he was relieving the boredom of rehab by hitting a few balls against a practice wall at the Oxshott Village Sports Club just down the road from where he lives. If the good people of OVSC woke up on Monday to find said practice wall had been reduced to a pile of rubble, we can assume that the hitting session did not go well. It may only be a couple of months since he had a tin hip fitted and he may only have been playing a pile of bricks and mortar but the Muzz doesn’t take well to losing. Not to anyone. Not at anything. But back to the storyline: the start of the year and the following three months highlighted the exceptional talents of the new generation. From Stefanos Tsitsipas (the champion of Provence, a finalist in Dubai and a semi-finalist at the Australian Open) and Naomi Osaka (the champion of the US and Australian Opens) in Melbourne, we were presented with Felix Auger-Aliassime (finals in Rio and semi-finals in Miami), Bianca Andreescu (the champion of Indian Wells) Daniil Medvedev (the champion of Sofia, a finalist in Brisbane and a semi-finalist in Rotterdam), Ash Barty (champion of Miami)…every week, a different name but all of them younger and hungrier and willing to push the establishment out of the way to get to the silverware. And yet clay is the great leveller. Osaka, the world No.1, is no dirt-baller, Tsitsipas fancies his chances against anyone on a fast court but knows his limitations on the red stuff, the fabulous Felix reached the Rio final on clay so could continue his upward career path but he is still only 18, Andreescu says she likes to slide on clay but last year played only two matches on the stuff at ITF level (won one, lost one) and lost in the final round of qualifying at Roland Garros. Meanwhile, Medvedev has yet to win a match at the French Open and, anyway, his favourite surface is grass. While everyone else has been operating a revolving door policy to the winners’ podium, one bloke has stood firm, as ever. Federer, that 37-year-old whom everyone keeps trying to write off, has reached the final of his last three tournaments and won two of them – Dubai and Miami. He has now won 101 career titles and is planning to dirty his toes in the red brick dust for the first time since 2016. Madrid is scheduled to be his first port of call and from there he heads to Paris. No one expects Federer to win in either Madrid or Paris (that fella Nadal is the nailed-on favourite on any clay court) but if he can keep the momentum going, keep winning matches, then the shift to the grass courts in June should make for some intriguing viewing. And by then, the Muzz may even be back in training (the earliest the medics will allow him back to some semblance of the day job is late May). The new kids may be having a field day at the moment but the old boys are not done yet.